Second-Generation Satellite Constellation The Globalstar second-generation constellation will consist of 32 Low Earth Orbiting (LEO) satellites. The Globalstar satellite is simple; Each consists of a communications system of both S and L-band antennas, a trapezoidal body, two solar arrays and each satellite operates at an altitude of 1,414km (approximately 876 miles). 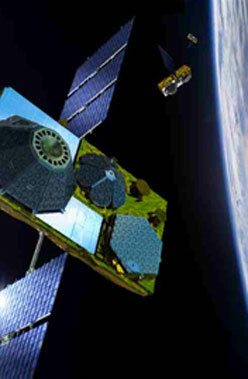 The second-generation satellites are manufactured by Thales Alenia Space. The satellites utilize "bent-pipe" architecture. On any given call, several satellites transmit a caller's signal via CDMA technology to a satellite dish at the appropriate gateway where the call is then routed locally through the terrestrial telecommunications system. Globalstar, Inc. (Nasdaq:GSAT), today announced that the deployment of its second-generation constellation has entered the home stretch with the planning of an early February launch with its launch services provider, Arianespace. A successful fourth launch from the Baikonur Cosmodrome in Kazakhstan and subsequent deployment of the satellites will complete the return of the high quality and reliable service that Globalstar users have historically enjoyed. With three launches already complete, current subscribers and new users are experiencing significantly improved performance and reliability with the industry's highest voice quality, fastest mobile satellite handset data speeds and the most affordable service. Channel partners are also enjoying greater demand for product as well as increased inquiries regarding Globalstar's resurgence. The next few weeks will be extremely busy for Globalstar's Space Operations Team as the fourth launch campaign begins. Satellite manufacturer Thales Alenia Space has confirmed that the review and shipment of these six spacecraft will be completed by the end of October, allowing pre-launch preparations to begin at the Cosmodrome for an early February launch. A launch during the first week of February allows Globalstar to place two of the new satellites into service almost immediately after launch. Globalstar also announced that all but one of the previously launched satellites have now been placed into service as of September 29th. The one remaining satellite is already in its operational plane and is awaiting the upload of a software upgrade to remedy the previously reported momentum wheel issue. Globalstar expects to receive the software upgrade from Thales in mid-October, upload it into the satellite and then place it back into operation. This upgrade will be available for Globalstar's other second generation satellites, if necessary. "Since Globalstar embarked on a mission to be the first MSS provider to launch a second-generation LEO constellation, nothing about this process has been quick or easy," said Jay Monroe, Chairman and CEO of Globalstar, Inc. "After six long years, we are proud to report that the finish line is within reach. Although the deployment of our new constellation with its improved design and capabilities has had its challenges, we can finally look forward to the long-term reliable service the new constellation will provide to our customers. We thank all of our partners for their tireless effort and our customers and distributors for their patience and support throughout the project."